Farmers and food service directors exchanging contact information. Many school districts are interested in purchasing more local fruits and vegetables but lack the needed connections to make these changes. 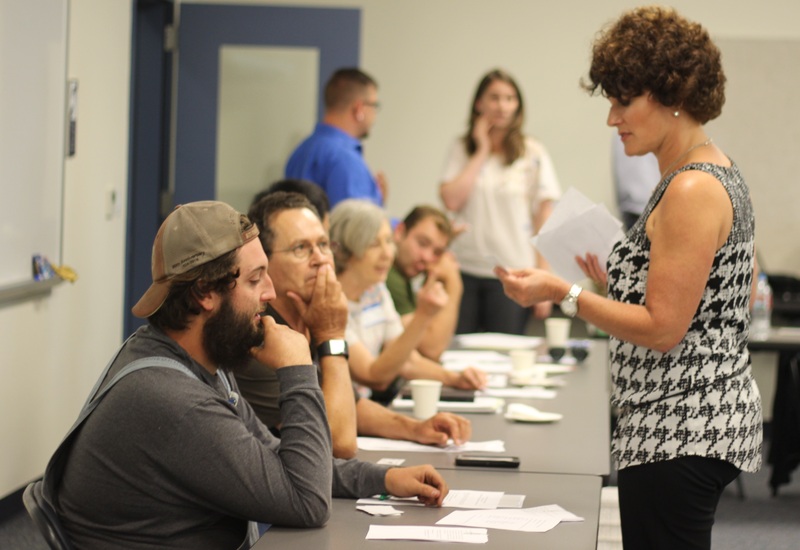 This past July the Bay Area nonprofit Fresh Approach brought together farmers and food service directors from eight districts in Contra Costa County for a face to face meeting to build relationships and facilitate purchases from local farms for school meals. Buttercup Farms in Clayton, First Generation Farmers in Brentwood, Cipponeri Family Farms in Turlock, Swank Farms in Hollister, and a produce distributor from Davi’s Produce, attended the event and provided a little background on what they grow and the logistics of working with their businesses. Food service directors were able to ask specific questions regarding pricing, delivery, and availability. Attendees took time in the morning for a tour of Pittsburg Unified School District’s new warehouse which will act as a food hub for the other districts. The space will allow for larger fresh produce purchases that can then be distributed to the other Contra Costa County school districts. The group’s collective purchasing is supported through a USDA Local Food Promotion Program Grant with guidance from the CDFA Office of Farm to Fork and the Center for Ecoliteracy. In addition to discussing regular purchases, farmers and school food service directors discussed the possibility of last minute menu changes based on crop availability. The meeting allowed for farmers and school districts to discuss their respective challenges as well as areas for collaboration down the road. Both farmers and food service directors left with contact information and plans for fall fruit and vegetable purchases. This entry was posted in CA Farm To Fork website on August 9, 2016 by California Farm to Fork.